Ms. Dzamashvili concentrates her practice on probate of decedent's estates, guardianships, some real estate, and health law related matters. 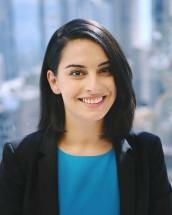 Ms. Dzamashvili has interned for Equip for Equality, the Centers for Medicare and Medicaid Services, and was a Client Advocate for Loyola University Chicago School of Law's Health Justice Program where she advocated at no cost on behalf of members of the community- focusing on the population that is legally underserved. Ms. Dzamashvili hopes to continue to be a resource to the communities that need it most. Ms. Dzamashvili received her J.D. from Loyola University Chicago School of Law where she was a member of the Health Law Society and received a Certificate in Health Law from the Beazley Institute for Health Law and Policy. She received her Bachelor of Science in Public Affairs degree from Indiana University with a minor in business.